Letter from Jack to Harry Seidelman, dated December 8, 1939. 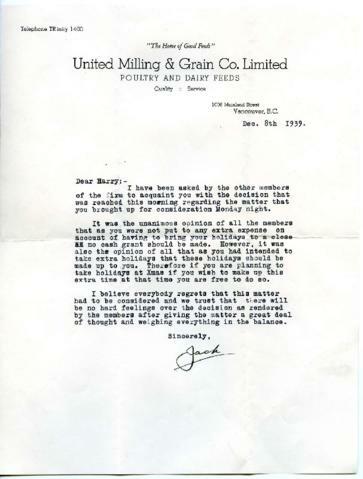 It is assumed that both men are working at the United Milling & Grain Co. Ltd. Letter discusses a matter concerning making up missed holidays to Harry. Two anonymized opinions from members on this matter can be found in Items 5 and 6 of this file.